Those are two words that aren’t usually associated – Alzheimer’s and hope. The possibility of (or even worse, the diagnosis of) Alzheimer’s strikes fear in one’s heart, and in the hearts of those to whom we are connected. Modern medicine has not succeeded in finding a cure or a way to prevent the decline in brain function, so why is there any reason to hope? Dale Bredesen, M.D., has changed the paradigm! 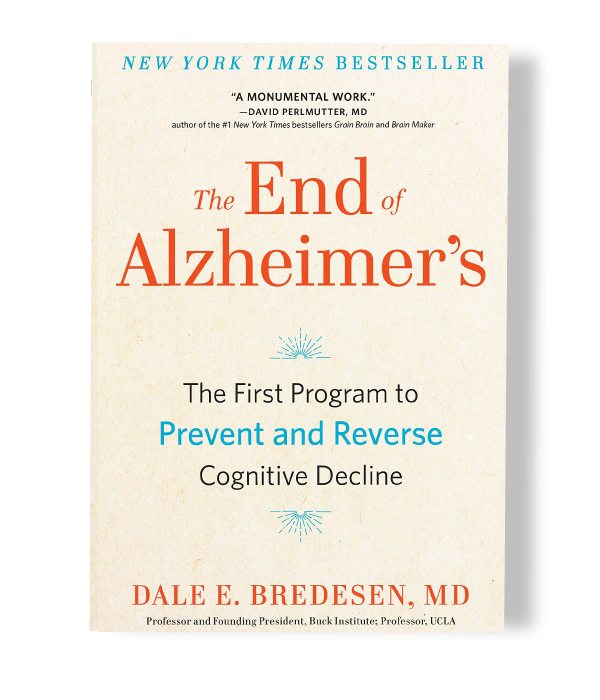 In his 2017 book, “The End of Alzheimer’s: The First Program to Prevent and Reverse Cognitive Decline”, he states: “Alzheimer’s disease can be prevented, and in many cases its associated cognitive decline can be reversed.” That gives me the shivers! He includes stories of many of his patients who have succeeded in doing exactly that. Hope! Dr. Bredesen is a practicing neurologist who has been researching dementia for decades. The premise of his work is that Alzheimer’s has many different potential causes (36, as of the time of book publication), which is why just one drug will not be the answer. The key is to identify the unique biochemical, genetic and metabolic factors affecting a particular person and address each one. He calls this the ReCODE protocol (Reversing COgnitive DEcline), and his book is a very thorough map through the evaluation and treatment process for each factor. The first step is evaluation to identify abnormalities and vulnerabilities, because you can’t fix problems you don’t know about. It is so much easier and more effective to find problems before they cause symptoms. Take diabetes, for example: insulin function can be abnormal for years before finally failing enough to cause the symptoms of excessive thirst and excessive urination. And we can prevent insulin abnormalities from ever getting bad enough to result in diabetes – with diet, lifestyle, supplements, exercise! This is a table of the tests Dr. Bredesen includes in the ReCODE protocol. Another recommendation he makes is to start screening for abnormalities on everyone 45 years or older! My parents are both gone now (and both of them had signs of cognitive decline in their latter years), but many of my friends are concerned about their aging parents and their cognition. Some may not want to even do some basic brain function testing because of worry that the results might point out some problems. Don’t wait! Do it as a family! Consider an assessment of brain function as a routine screening test like a colonoscopy or a mammogram. One of the simplest cognitive tests is the free Montreal Cognitive Assessment (although this is easier to do with 2 people; I found it cumbersome to do alone on myself). The test is on one sheet, and the instructions are on another. Many of these tests are not part of an annual physical exam, so you must be proactive in asking your doctor to order them. There are also some lab companies that allow you to order your own lab work, such as anylabtestnow.com, Life Extension Lab, and Direct Patient Labs. On their websites, each company will have instructions on drawing site locations and test kits. Also included in the book are optimal ranges for each test, which are not the same as the “normal” reference ranges printed on the lab report. Another issue is insurance coverage for these tests. Insurance companies may have a preferred lab, or an in-network lab. Because of the contracts between insurers and labs, test costs may differ for different insurers, even at the same lab. Also, costs you may incur will vary, depending on your particular insurance plan and deductible. However, the value gained by avoiding lost years of productivity and the cost of assistance or nursing care will make this evaluation one of the most valuable investments in your future that you can choose to make. The entire testing panel may be overwhelming, but you can always break it down into smaller chunks. Testing and addressing even a few of the factors on Dr. Bredesen’s list can help brain function. For those who want to discuss this with their doctors, the references for the ReCODE protocol are below. This is a new year – and it comes with the opportunity to invest in your future by investing in your brain. Don’t wait! Bredesen DE. Reversal of cognitive decline: a novel therapeutic program. Aging (Albany NY). 2014 Sept; 6 (9):707-17. Bredesen DE., Amos EC, Canick J, Ackerley M, Raji C, Fiala M, Ahdidan J. Reversal of cognitive decline in Alzheimer’s disease. Aging (Albany NY). 2016 Jun; 8 (6):1250-8.